Finding creative, playful ways to get people thinking about ecological issues is one of the things that always fires my curiosity. 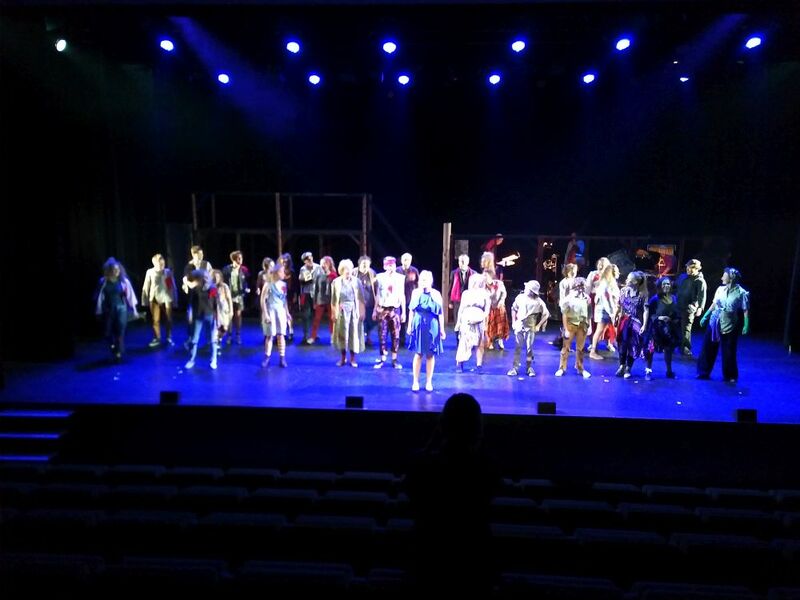 So, when I was in Brussels recently, I was intrigued to be invited to attend the final dress rehearsal of a musical called ‘Urinetown’ put on by Brussels Light Opera Company (BLOC). Yes, odd title, but it makes sense in the context of the play, and was inspired when its writer Greg Kotis was travelling in Europe and, for the first time in his life, encountered a toilet that you had to pay for. He teamed up with composer Mark Hollmann, and they wrote the play which went on to win 3 Tony awards and to be put on around the world. Before the show, I spoke to Director Emanuelle Vergier, BLOC Chairman Diana Morton-Hooper and musical director, and permaculturist (his programme notes encourage the reader to plant fruit and nut trees, among other water-saving strategies), and started by asking them, “why ‘Urinetown”? The story, in essence, is set in a dystopian town which is 20 years into a catastrophic drought, where water has become such a prized resource that the destitute citizens have to pay high taxes while also needing to pay every time they pee, with popping off into the bushes instead being heavily punished. The monopoly on supply water and places to pee belongs to a single dominating corporation called ‘Urine Good Company’ run by callous business tycoon Caldwell B. Cladwell, who pays off politicians and corrupt police officers in order to maintain the lucrative status quo. Inspired by Cladwell’s tender-hearted daughter, Hope, a naïve young hero, Bobby, rises out of the mass of the poor to lead his fellow citizens against the regime to fight for freedom. “Urinetown is filled with universal questions about the future (environment, politics, society, etc.) From the issues of capitalism with the rich getting richer and the poor – poorer to the rapid changes in environment caused by the neglect of the human race, Urinetown is the utopian satire of our prospective future if we don’t change our ways”. The cast is almost all amateurs, and they do an amazing job. In particular, Djavan van de Fliert and Zoë Sleath who play the lead characters Bobby Strong and Hope Cladwell, are amazing. It is now running until 3rd June at De Warandepoort Cultural Centre in Brussels. Go see it, you’ll never leave the tap running while you clean your teeth again. You can find out more, and book tickets, here. My standout line from the show? “Worldwide ecological devastation has a way of changing a man”. Doesn’t it just?